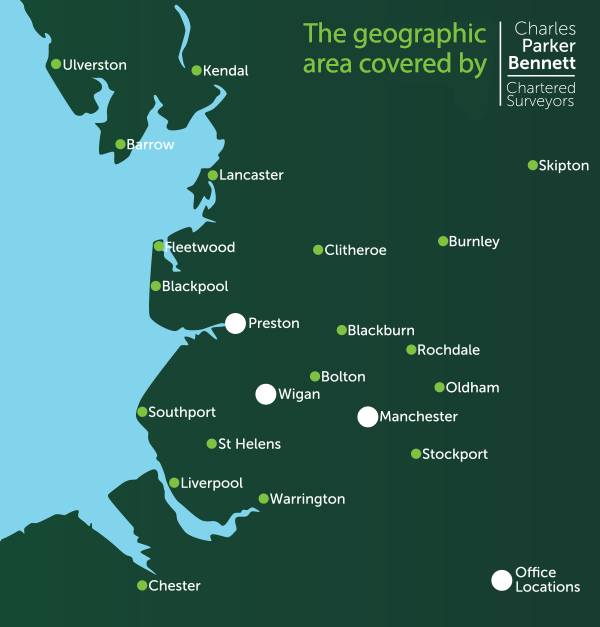 Charles Parker Bennett cover an extensive area which includes most of the North West of England take a look at the map below to see the region we serve. As Chartered Surveyors we are regulated by our governing body and are subject to strict guidelines and Codes of Practice. We are regulated by the RICS to ensure our finances are soundly managed and funds held, on behalf of clients, are secure. Our Chartered Surveyors are certified under the RICS Valuers Registration Scheme to ensure accuracy of valuation. Our surveyors, and reports they produce, are subjected to regular audits to ensure that strict standards required by many lending institutions and other bodies are satisfied. We operate an RICS approved customer care and complaints procedure. Our surveyors are committed to an ongoing CPD training programme to constantly refresh their knowledge in an ever changing market place.